Our inspections test exterior walls for insulation effectiveness, water-resistance, the finished surface appearance. If for any reason you have any questions or comments about our exterior insulations and finish system inspections and evaluations, feel free to give us a call at 888-304-3437 or fill out the form to the right and a representative will respond shortly. The main purpose of our exterior insulation and finish system inspections is to assess water penetration issues that may be present and have them addressed. There are two types of Exterior Insulation and Finish Systems which include Barrier and Water-Managed. 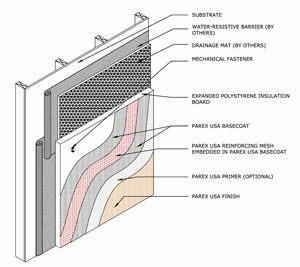 Barrier EIFS applications were before the year 2000 and water-managed EIFS was introduced around 1996. Our exterior insulation and finish system inspections are considerably more affordable compared to our competitors and Cliff Kapson Consulting is available for inspections and consultations anywhere in the United States. If for any reason you have any questions or comments about our Exterior Insulation and Finish System Inspections, feel free to fill out the form to the right and an associate will respond shortly or give us a call at 888-304-3437.